Saturday we lined up for a kermesse race, 25 laps of 3.2km and a total of 1300hm. After working to close all attacks making sure nothing got away without us, it came down to a sprint. Lining up to help Tone to the finish, Janicke closed one last attack as Ingrid brought Tone safely to the last corners. Tone thanked her teammates by doing her job perfectly crossing the line first. 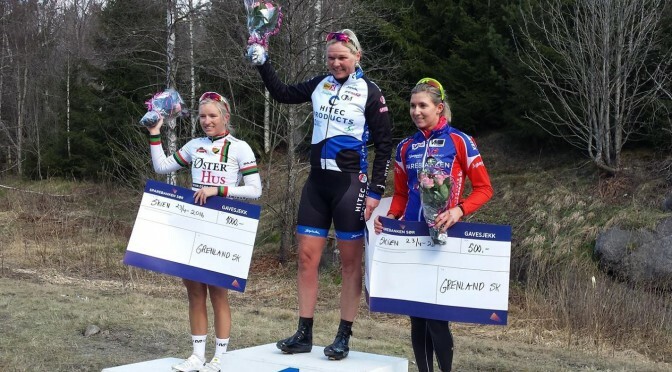 The young Elise Andreassen (Sandnes SK) sprinted to second with Birigtte Ravndal (Grimstad SK) in third. Sunday it was time for the Norwegian Cup in freezing condition early morning, a hilly road race of 5*22km. With Ingrid who is capable of climbing with some of the best riders in the world it was never a question who to work for. We decided not to go to hard in the beginning with Ingrid accelerating on the climb the third lap to thin down the peloton. Tone did a lead out in to the hill and Ingrid caused the peloton to split into a lead group of ten riders. On fourth lap she continued and more riders got dropped. On the final climb she got clear and could celebrate crossing the line solo ahead of up and coming Katrine Aalerud (Bryne CK) and Vibeke Dybwad (CK Victoria) in third. Tone finished in the peloton behind showing that her climbing legs are improving after working hard through the winter. Janicke has had an early season with some sickness and was not up to speed, planning a thorough check up before continuing the season.